JP520 shredders for all mining of stainless steel, has excellent corrosion resistance, suitable for coarse crushing and drying brittle materials, materials for low softening point should not use the machine. 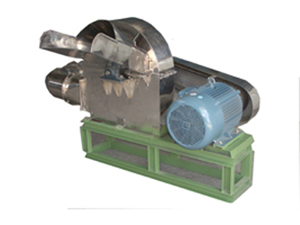 The machine is equipped with the activities on the rotary blade cutter, and a fixed blade fan, when added to the finished material crushing cavity under high-speed rotation of the blade material crushing, air flow generated by the fan will be crushed by the crushing cavity send after mesh sieve into the trap. The machine novel structure, smooth operation, high yield.